The notes of the meeting can be downloaded here. The Ouseburn Board met on 7th November 2017 and the notes of that meeting can be viewed here. The notes from the meeting can be downloaded here. 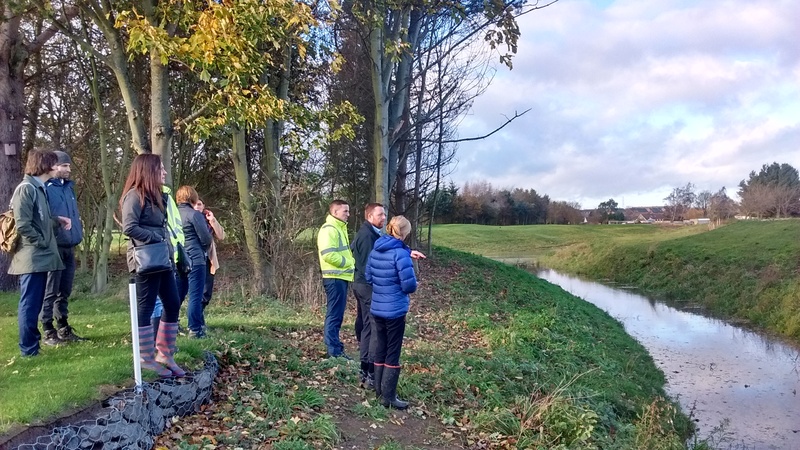 After the meeting, Paul Davison from Northumbrian Water Group kindly led us on a site visit of Brunton Park Flood Attenuation Scheme. Site visit of the Brunton Park Flood Alleviation Scheme. We held a co-ordination meeting on the 16th March 2015. Like a mini-conference, the aim was to bring together many of the existing projects operating in this area, towards a joint shared understanding. A small group of representatives met on the 13th October 2015 at Ouseburn Farm, following on from the “Evidence & Measures” workshops in the summer. We looked in detail at the actions that were agreed then, broadly along the topics of “planning & development”; “waste water” and “land management”. Notes from our meeting can be downloaded from here: Ouseburn E&M focused group notes 13Oct2015 and a summary of the actions from the meeting. We hope to meet again in early January 2016. Representatives from the Environment Agency and Natural England will co-ordinate some actions relating to farms, golf courses and race courses.